Political candidates Kate Matteson & Gina Trish are using the death of a young woman in Charlottesville, Virginia, to promote their political campaign. With their fundraising lagging behind their Republican opponents, the pair are improving the financial prospects for their upcoming legislative election, according to campaign professionals. Matteson & Trish have even stooped to using the tragic death of a young protestor at the hands of a violent, racist, National Socialist to attack their Republican opponents. It will be remembered that earlier this year, the Democrats called Assemblyman Space a "racist" for suggested that drug traffickers who sell to minors suffer the maximum penalty under federal law. On their campaign Facebook page, Matteson & Trish suggest that not capitalizing on the death of the young woman is somehow the same as being a Nazi. They behave as if everything, even death, needs to be monetized for someone's benefit. One has to wonder, just where is their humanity? In fact, the Republicans did issue a statement, available on their website, in which they focus on upholding and protecting the rights of people to peacefully protest and on increasing the penalties against criminals -- like the racist National Socialist -- who harm those engaged in peaceful protest. They suggested that, if convicted, the death penalty is appropriate in the case of the National Socialist who killed the young woman in Charlottesville, Virginia. It must be noted, that despite numerous requests, Democrats Matteson & Trish have failed to issue a single comment on their support of the Women's March (which they have publicly linked their campaign with), a group that "honored" cop-killer Joanne Chesimard (aka Assata Shakur), a terrorist on the FBI's "most-wanted" list. 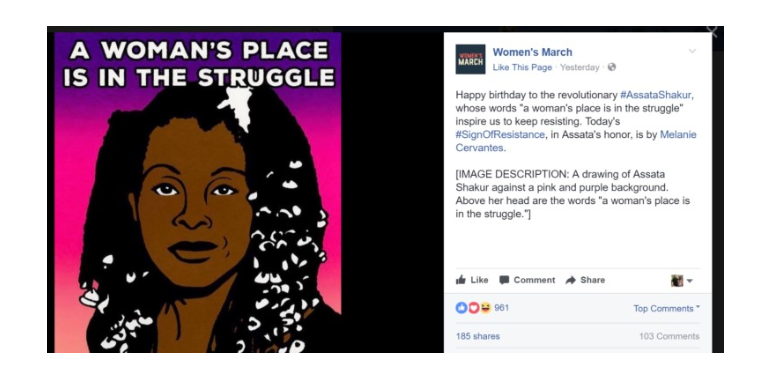 The Women' March organization issued a statement "celebrating" Ms. Chesimard's birthday, praising her as a "revolutionary" and stating that Chesimard -- who murdered a New Jersey State Trooper in cold blood -- "inspire us to keep resisting." Democrats Matteson & Trish have failed to issue a single comment on the leader of the Women's March calling for "jihad" against the democratically elected government of the United States of America. Instead, the Democrats and their allies have continued to praise the Women's March -- lending their support to its leadership while American troops are in the field, engaged in a fight against jihadists. Why have they refused to comment on these threats of "jihad"?